When he tasted these, my boyfriend said, “Did you come up with this in your own head?”. Why yes, I did. He knows I pretty much improvise most of what I do (with a notepad, since having started the blog), but these were so good he had to ask. When it’s nice and melty, get the the balls out of the freezer, and remove bowl of chocolate. Set yourself up with everything in a row on the counter. Don’t waste any chocolate. Be sure to lick all spoons and clean the bowl by eating before washing your equipment. Tomorrow: Cranberry White Chocolate Truffles! Thursday: Your fancy looking, but easy to make Christmas Breakfast. YUMMY! Ingenious, I say! I really have to try making my own crystallized ginger. 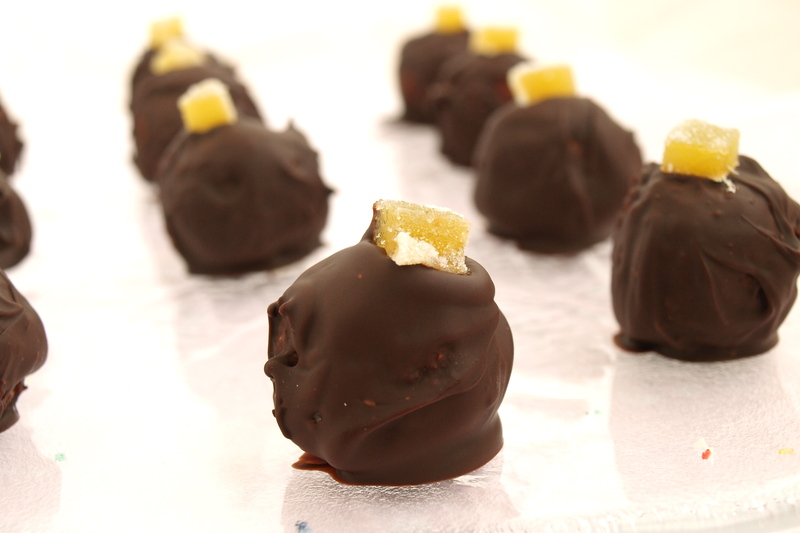 Then I can give these gorgeous truffles a go.